Preface: While passing the fountain near the Stanford Bookstore on Sunday, there were dozens of flyer posted announcing "Phillip Huber's Suspended Animation Monday, October 29th, 7 pm, Kresge Auditorium". A photo showed Huber holding a stringed robotic figure on his hand. What got my attention is the quote on the bottom of the flyer from Heinrich von Kleist's The Puppet Theater: "...when consciousness has, as we might say, passed through an infinity, grace will return; so that grace will be most purely present in the human from that has either no consciousness or an infinite amount of it, which is to say either in a marionette or in a god." I recall reading this inspiring passage in von Kleist's On the Marionette Theatre (1810) in Prof. Butkatman's "Cinema-Machine" class last spring. 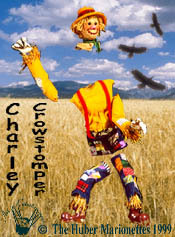 Afterwards I wrote this haiku on May 23, 2007: "Puppets not weighed down / by gravity. Like God, they're / in a state of grace." Now, I'm excited on going to this performance. When I got to Kresge at 6:45 pm Monday, there was around 20 some students. I asked one student what this show was about. He said it's part of the IHUM (Introduction to Humanities) class required for all undergrads. This semester the course is on "Humans and Machines". 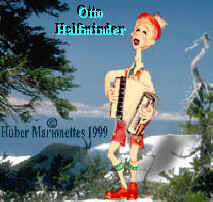 I asked "Are they going to show a film of Philip Huber and his marionettes? 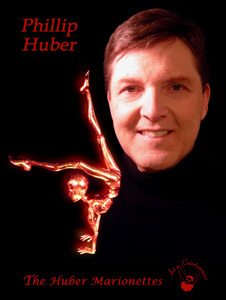 The student said that his instructor told the class that Philip Huber will appear personally to give a talk & demo. There was some stage set-ups for a puppet show. As 7 pm approached, more students showed up, and by 7:05 pm, the whole center aisle of Kresge was full. Prof. Scott Bukatman came as they reserved a seat for him in the second row. He saw me sitting in the sixth row on the aisle and waved "Hi Peter!" I waved back. Then Philip Huber appears on stage and tells us: "I'm going to create an hour of illusion with cloth and wood. I'm going to treat you with my marionettes in cabaret style action. You'll be seeing vignettes. There are no secrets and I'll explain how it works afterwards. You'll see a simple unabashed performance." It was simply brilliant! I was overwhelmed by Salzburg Marionette Theater performance of Magic Flute while visiting Mozart's Geburtshaus in Salzburg (August 1972). One of my favorite spiritual stories is Anatole France's Our Lady's Juggler (1892) which I saw a puppet performance at Cornell. The mime performances of Marcel Marceau have inspired my work in biochemistry and poetry. 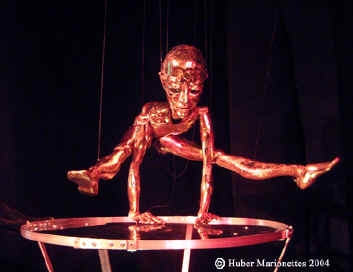 Now I'll include Phillip Huber's Suspended Animation with these inspiring moments. He is that good! I took 11 pages of notes, five in the dark during the performance and six pages of Q&A in the light. Below are the marionettes in the order of the performance at Stanford. I've used the images from Huber's web site and his description at left with my haiku notes at right. A graceful bird in flight. Acrobatic skills that give you chills. brings flag waving to a new high. sings lyrics without any words. With A's & T's to spare. who has a new act you'll admire. but outstanding when on the high wire. the high wire over Niagara! except when she pouts and stamps her feet. until we give her some bubble gum. 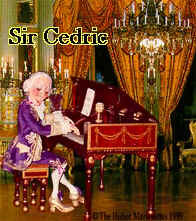 comes a "Liberace" of renown, or so we've heard. Pithy Kingsly Hardwick... the Third. But loves to skate in grand display. 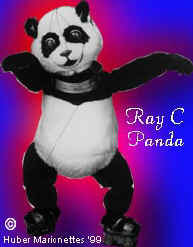 soon land this panda on his...derriere. the elegant, classy, and sassy Nicole. she sings "it's a paper moon". 7:40-7:50 pm 10 minutes intermission for stage scenic change. is a stretch she has to make. In Eloquent voice of the violin. 8:00 pm Phillip Huber gave a 5-minute talk-demo on the number of strings used on his marionettes. even-keeled. A tiny jerk and Louisa will not keep her balance on the trapeze and tumble off the bar. This lady's path is deftly made. In sprite-like lightness, Arianna Blade. you keep me in suspense." A body sleek in shiny gilt conducts a careful plan. turn like a pretzel of old. described in a riddle, now here's the clue. but it has a fur coat and a cold wet nose. because he's made of hay. An old woman with a dream. She needs a change of scene. to reveal the star within. The city lights are in her sights. where she sings and shine! Q: How much does the average puppet weigh? A: The trapeze artist weighs 1.5 pounds. The opera singer weighs 6.5 pounds. There are 23 strings for the Diva. She has facial animation, neck stretch for high notes. Then there is her mouth twist, double eye animations, eyelids can cross over them. She can do heavy breathing and the double strings in the hands let her pick up her dress. her made of wood and cardboards and it weighed also 6.5 pounds. Q: Do you develop relationships with your puppets? the audience will not be involved in the different acts on stage. Q: Do you dream up your acts? I learned tap dancing. My business manager gives me ideas on some of the acts. it out so you can't hear it. There are two strings for him to tip his hat. He has an all-American tooth-to-tooth grin. He has dentures held by magnetic catch. Only Carol Channing has a smile like his. He has a flag tucked in his suit. 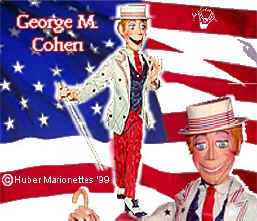 It takes 2.5 feet of strings to pop out the flag at the end of his act. Q: Can you tell us about the hand movements of the instrumentalists? and run the other hand across. 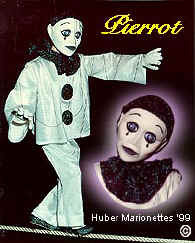 Originally the puppet had moving fingers. the puppets more their due. 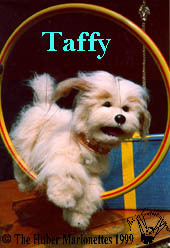 Q: Do you have a favorite puppet in your act? A: These are extremely technical performances. I made mistakes today. Nicole's fur wrap was stuck by a pin and I had to remove it myself instead. I didn't set it up exactly right. So the dog had trouble to untie the knot. 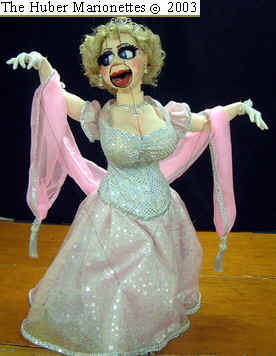 My favorite puppet is Shirley U'Jest the singer which was made in 1983. 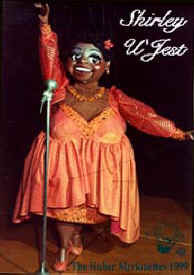 She's modelled after Nell Carter [1948-2003], the American singer & actress. Nell Carter. 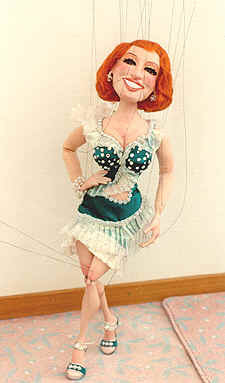 She performed live and I did my puppet rendition of her. The audience loved it. They took photos of Nell Carter and my puppet look-alike. 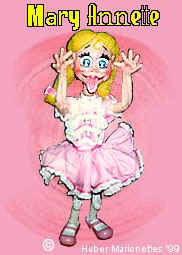 Nicole puppet and said "This is the real me!" We all had a good laugh. of the microphone stand while she's singing. Q: Why did you choose your acrobat to look like a robot? [Cirque du Soleil] to observe some of their acrobats and their muscular movements. 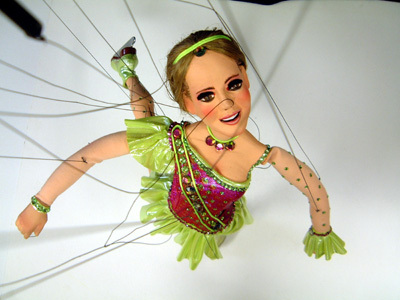 I wanted a marionette with controlled actions. I want you to see all the bodily actions. his movements. The same strings are attached to his feet. His mask comes with a magnet. A: I have four or five translations of Heinrich von Kleist's essay "The Puppet Theater"
controls their action. One needs to find the right center of gravity to use the arms and legs. so it was more challenging than my usual stage performances where I had more control. Q: What are you thinking about when performing with the puppets? A: Mostly the personality of each puppet. My hands are connected to the controls. I'm so comfortable with it that the puppet will do something they've never done before. Once Liza did some new movements that I'd be impressed. I live through the characters. I must keep focused on the strings for the Contortionist's acrobatic movements. For each performance, I try to get to their specific personality. Thank you all. 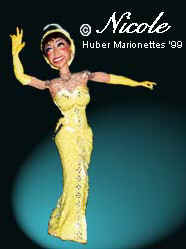 After the show, Huber invited the students to look at his marionettes on stage and even take photos of their favorites. I wished I'd brought my camera here to take pictures of him and his amazing marionettes. My favorite was his little dog Taffy and patted him on the head. During Huber's performance, he was so cute and even let out a little bark. 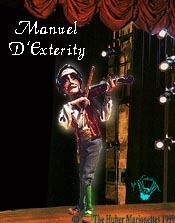 Prof. Bukatman got on stage and requested a photo with the marionette Liza Minelli which his students took. Because of the Heinrich von Kleist quotes on his flyer, I thought Phillip Huber was from Germany. I had communicated with Robert Huber of the Max Planck Institute who sent me crystallographic data on bovine pancreatic trypsin inhibitor while I was predicting protein structures (1973-1980). Robert Huber won the Nobel Prize in Chemistry in 1988. One of the students asked if Phillip Huber is from Europe, and Huber said he's from Nashville, Tennessee, but is often on tour. I asked Philip Huber to autograph his flyer and exchanged business cards. I thanked him for an amazing performance of dextrity and musical entertainment that transported us to fantasy land. "Puppetry College: where puppeteers learn the ropes"
"Playing with Dolls: Phillip Huber"
"A Master at Stringing the Audience Along"
"Puppets give voice to universal emotions"
Reviews for "Being John Malkovich"